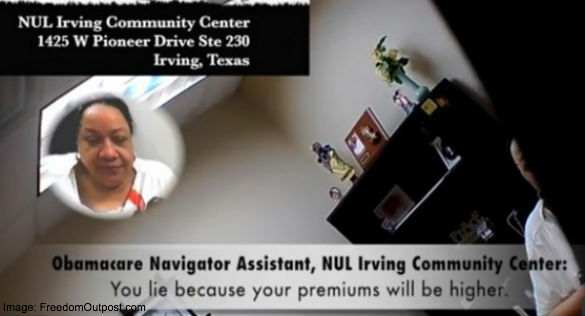 One of the navigators exposed in O’Keefe’s video pretty well sums-up the Third World-style corruption behind the entire enterprise of drafting, selling, passing and implementing ObamaCare: “I always lie on mine,” says she. However, there are, as Claude Frédéric Bastiat observed so presciently, two kinds of “plunder” or corruption: legal and illegal. One, the illegality O’Keefe documented, is the kind of everyday venality that laws have been passed to prohibit and punish since the dawn of lawmaking. Wrong as outright theft and lying by government employees or contractors is, the other kind of corruption is much more damaging. This is the “plunder” or corruption that is legal and has been institutionalized into law on a regular basis by Barack Obama and his radical liberal allies in Congress. This is the kind of corruption that has paid nonprofits and community organizations some $67 million to hire navigators nationwide to bring corruption and legal plunder to a neighborhood near you. According to an article by John Fund for National Review Online, records show that the National Urban League, employer of the navigator who told O’Keefe’s guerilla journalist to lie, was paid $376,000 by the federal government for its Obamacare outreach in Texas. Even more troubling to those who watch for corruption in the political process is the close association between navigators and Obama-associated political organizing groups. As we see it, the corruption is built into the system. ObamaCare is a vast wealth transfer mechanism designed to institute an all-pervasive system of legal corruption to buy votes for Democrats by, as Bastiat stated it so eloquently, making plunder universal under the pretense of organizing it. You can watch James O’Keefe’s video expose of the corruption of ObamaCare navigators through this link.